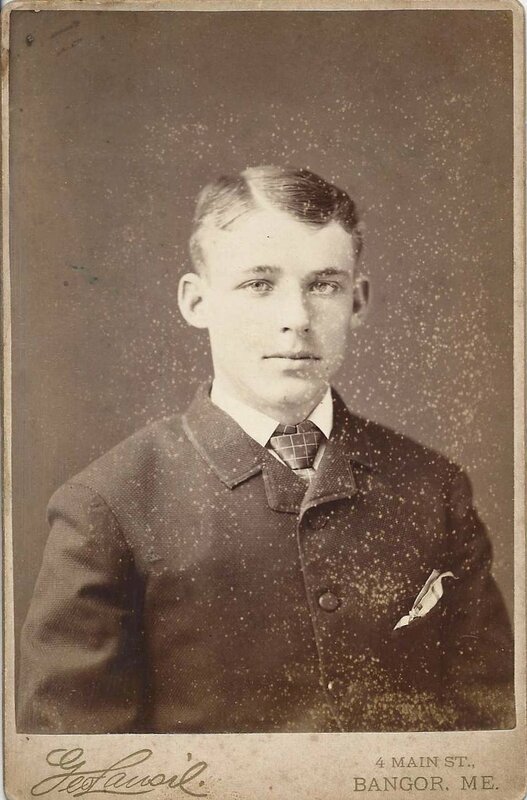 Photograph of a young man identified on the reverse as George Gould, Class of 1886. The photograph was taken by the George Lansil studio of Bangor, Maine. 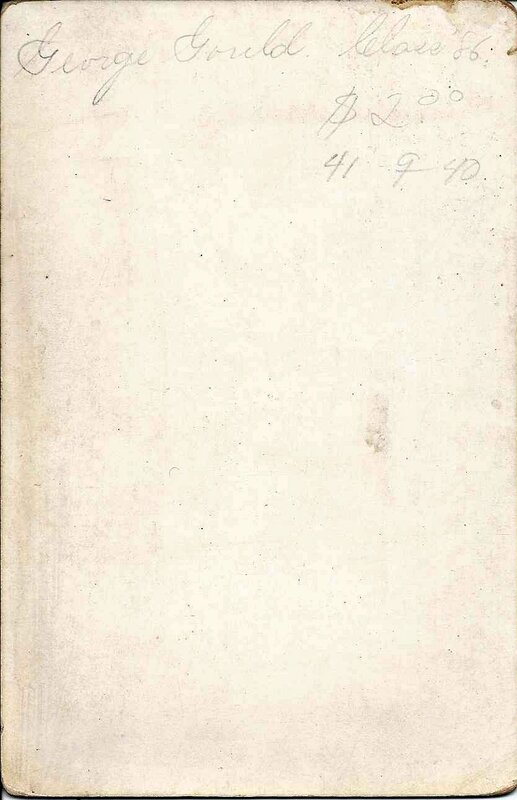 A helpful librarian at the Fogler Library at the University of Maine in Orono, gave me a heads up that a George Pendleton Gould of Stillwater, a village in Old Town, Maine, graduated with a B.S. in 1890. This photograph was found with four photographs of young women, taken by the same photography studio and all mentioning Class of 1886, though three of them gave the women's address as Bangor, Maine. I can't make out the full names of two of them, but research on the other two shows them as born in 1868 as was George Pendleton Gould and living either at Old Town, Maine, or adjacent Orono, Maine. 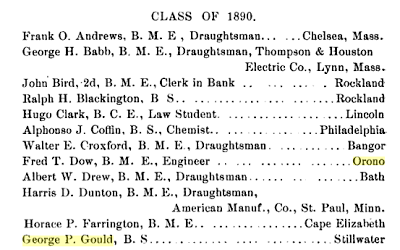 However, there's another George Gould in the area. 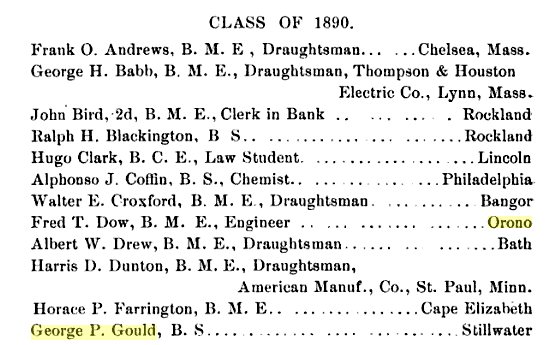 He was George Parker Gould, born in 1870, and a resident of Orono, Maine, as shown in the 1880 Census. It's possible that he graduated in 1886. I'm leaning toward George Pendleton Gould, but I'm including family history on each of them, just in case. 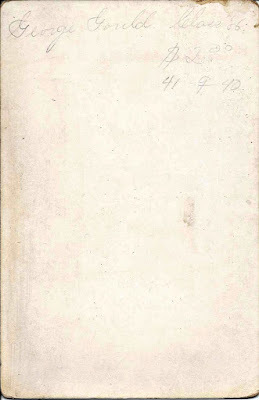 Hopefully a reader will recognize the young man from family albums or research and leave a comment to resolve the mystery. George Pendleton Gould was born 21 August 1868 at Old Town, Maine, the son of James Howes Gould and Frances Adelia (Fall) Gould, who were born at New Sharon, Maine [though one record has James born at Levant, Maine] and Charleston, Maine, respectively. George's paternal grandparents were Oliver and Lydia (Howes) Gould. His maternal grandparents were Otis and Sophronia (Norcross) Fall. On 11 January 1894 at Old Town, Maine, George Pendleton Gould married Lydia M. Stormann, daughter of Charles and Josefa (Hirsch) Stormann, immigrants from Prussia and Bavaria respectively. Lydia was born about 1872 in Maine. George and Lydia settled at Bangor, Maine, and had at least two children, both daughters: Madeline Lydia Gould, who married Robert Donald MacIver; and Antionette Walker Gould, who married Norman Elvin Torrey. According to the Censuses, George worked successively as a railway postal clerk, an insurance agent and clerk of courts at Bangor. George Parker Gould was born 2 September 1870 at Orono, Maine, the son of Charles M. and Mary Frances (Gilman) Gould, who were born at Lisbon Falls, Maine, and Sebec, Maine, respectively. George's paternal grandparents were Jessaniah "Niah" Gould and Priscilla (Whitney) Gould. His maternal grandparents were Benjamin O. and Alice Kent (Morrison) Gilman. If George married, I didn't find a record of it. He was a dry goods merchant at Bangor and Orono. I found a death record for a George P. Gould, age 92, at Bangor, Maine, on 27 July 1961. Online trees give that death date for each George, another indication of how you have to take online trees with a grain of salt. Working out the lifespans points to its being the death record of George Pendleton Gould. Again, if you recognize the young man in the photograph as either of these George Goulds, or perhaps another George Gould, please leave a comment or contact me directly.